Made from wood salvaged throughout Europe, this cookbook stand gives your kitchen a dash of rusticity. Simply cooking Grandma's famous pasta sauce can bring you back to Sunday afternoons spent in an aromatic kitchen. Prepare family favorites and new standbys with this handsome cookbook stand by Stacy Borocz, rich with its own striking history. Beautifully crafted from a sturdy slab of reclaimed timber that has been salvaged from old European buildings, this bold design is highlighted by industrial galvanized metal detail. 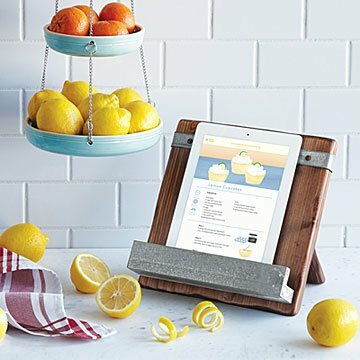 A natural beeswax and mineral oil finish brings rich appeal the unique wood grain, while the ample shelf allows you to prop up cookbooks, iPads, or Grandma's handwritten recipe. Made in Hungary. Due to the recycled nature of this item, each is unique and will vary. Use a food safe Butcher Block Conditioner to maintain moisturized wood. Help condition and preserve your cookbook stand with mineral oil. We have always had to struggle with cookbooksâ€”this makes it easy and is beautiful to boot! What a perfect cook book stand!!! It's gorg on its own without anything in it! A true masterpiece!! Great gift for folks who have it all. Perfect for large kitchens. Probably not great for smaller spaces. The finish and look are great. It would be nice if the holder had an insert to accommodate an iPad or iPhone. Lots of recipes are online now. I built one myself with a spare piece of wood. I gave this gift to 4 people this Christmas...everyone loved it! I love this cookbook stand! This cookbook stand is beautiful and beautifully constructed. I own one myself and have given this as a gift to others. I have it out on the counter all the time because it is so pleasant to look at. The stand holds a cookbook open and an iPad in place. I use it all the time. My wife loves cookbooks and this is perfect and beautiful! Beautifully made. Came back for another one! Beautifully made. Looks great sitting on my island.